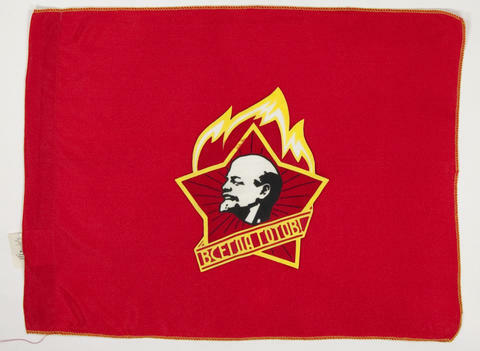 Small red flag with yellow stitching shows the emblem of the Young Pioneer organization of the Soviet Union, which is a star with flames behind it and Vladimir Illyich Lenin's face in centre and the words "Always Ready!" White tag still on flags with writing and numbers. It was produced in Moscow. Contains Russian text that translates roughly to "Always Ready! ", the slogan of the Young Pioneers. Date stamped on white tags: 1988.